Baseball Prospectus's Neil DeMause noticed recently, as had we and others, that something weird is going on with baseball attendance this season. DeMause notes that the Yankees, Mariners, Indians, Braves, Cardinals and Twins all set record lows at their stadiums this month, with the Cubs setting a record low since the dark days of 2002. The Rays' attendance is down 28 percent, and they hit a low since 2007. The AbysMets have been close to lows, too. A lot of baseball and sports biz types are buzzing about this, perhaps rightly so. After all, MLB predicted earlier this year that attendance would increase significantly in 2011. The implication is that baseball is somehow struggling, that in a depressed economy people have turned away from the sport. Maybe there's something to that, but the simple truth is that attendance is no longer the most accurate bellwether for the state of the game. Focusing on the empty seats ignores something vastly more important to baseball's owners now, something that at least partly explains the league's famously tight-assed and backward approach to new media: cable TV. There's no better measure of the primacy of cable now than the elaborate blackout restrictions thrown up around game broadcasts. If you are a Toronto Blue Jays fan in Yellowknife, Medicine Hat, or Banff, you cannot watch Jays games live on MLB.tv or MLB Extra Innings. And in case you're not a hoser, we should tell you that these places are all more than a day's drive away from the Rogers Centre. Jays games are blacked out nationwide. In the United States, the blackouts are not quite that severe, but they're close. Look at this sherbet of a map. You can't watch a Mariners game live on MLB.tv or Extra Innings anywhere in Washington, Montana, Oregon, or Idaho, a live Diamondbacks game in Arizona, Utah, or New Mexico. Or: if you live in northern Mississippi, you can't watch live Reds, Cardinals, or Braves games. Iowa is territory controlled by the Twins, Cubs, White Sox, Cardinals, Brewers, and Royals. Says Maury Brown, president of the Business of Sports Network: "The territories—especially for the Mariners— allow large broadcast agreements they wouldn't otherwise get. It's a massive swath across the country. For them? TV money is a bigger factor than the gate." MLB.tv is a supremely exciting thing for baseball die-hards: HD video, live streaming with data overlays, even on your phone and iPad. You can watch a bunch of games together, or not. Nirvana, except for those damned blackouts. The blackout's iron fist protects cable sports networks. Whereas NFL blackouts exist to protect attendance—games with unsold tickets don't air in the home market—the MLB blackout policy has nothing to do with ticket sales. Rather, it exists to strengthen cable broadcasters (regional sports networks, or RSNs) of baseball games. You have to subscribe to cable or satellite television to watch a baseball game if the team is within, really, a 10-hour drive. You may notice how zealous MLB and its partners are with regard to exclusivity: see MLBAM's persnickety correspondence earlier this week, or radio grouchiness in '04 after the XM deal. The league is particularly steely with cable rights because it's great business. There are conflicting reports about what YES and SNY, the Mets' network, charge cable and satellite providers, but the New York Times recently cited research from SNL Kagan that pegged SNY's average monthly fee at $2.38 and YES's at $2.80. Perhaps that doesn't seem like a lot, but how about this: each cable subscriber with YES (presumably much, if not all, of New York, New Jersey, and Connecticut) pays $33.60 yearly to an arm of the Yankees and $28.56 to an arm of the Mets. And that's on top of the commercials those networks get paid to run. Those rates continue to rise regardless of what non-baseball slop the networks throw on your screen: SNY has the Big East sporting events that ESPN doesn't want (think Providence-Seton Hall), but YES is worse—Nets games and Mike Francesa. So teams love RSNs: the Mets and Yankees, in essence, annually sell a moderately priced ticket to any household—no matter how much its denizens like baseball—located within a few hundred miles of the stadium. Moreover, Brown says, RSN revenues fall outside of what MLB considers baseball-related revenues, so their dollars don't factor into revenue sharing. Why wouldn't the Yankees or Mets want to do it, then? Other teams do it, too: NESN, which televises the Red Sox and Bruins throughout New England, charges $2.62 monthly per subscriber, according to MediaWeek (warning: PDF). MASN shows the Orioles and Nationals, and the network sued Comcast in 2009 for discrimination in central Pennsylvania and southwestern Virginia. And, yes, the Red Sox own 80 percent of NESN, while the Orioles and Nationals have joint ownership of MASN. The White Sox, Blue Jays, and Indians also have networks of their own. The Twins had such a network in 2004, though they struggled finding cable carriage and soon folded. Ditto for the Royals. The power of these team-owned regional sports networks—as opposed to those under the Fox Sports Net or Comcast SportsNet umbrella—is that they generate not only revenue but value for the teams. A TV rights contract is just a TV rights contract, whereas Forbes speculates that SNY, the Mets' network, is worth more than $2 billion. Owners want the value of a cable channel on top of their game telecast revenue, and not just because it's free from MLB's taxing hand. Consider: A network whose primary function is showing Mets games is now worth substantially more than the team itself. But there are long-range implications: Namely, so long as cable revenues continue to grow at an absurd rate, and we assume they will, given the crazy power RSNs have over cable providers and MLB's crazier blackout restrictions, teams will worry less and less about ticket sales. Brown says, "TV offers up something the gate can't do for most clubs: consistency. Few clubs, through good and bad, still draw fans. TV deals lock rates in, which gives clubs certainty of the revenue stream." This is the new paradigm in baseball—the ballparks are mostly empty, but the game's doing just fine. There might even be a silver lining here. DeMause speculates that a lot of teams might cut ticket prices. 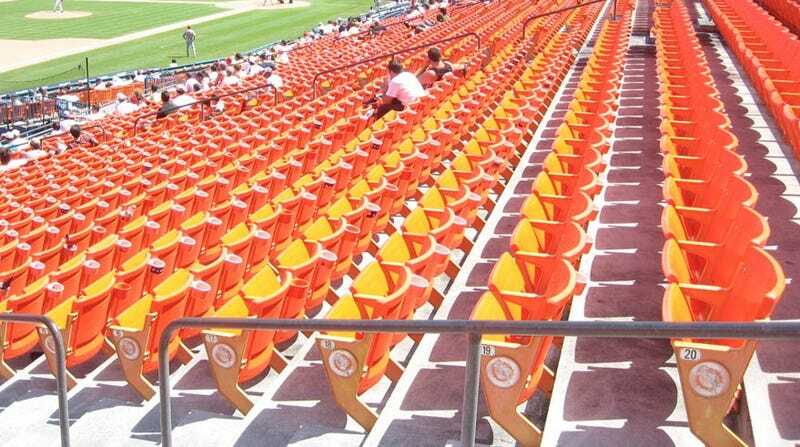 Brown says the New York clubs have focused on premium seating—but the Mets' premium seats are reselling for nothing. Of course, the game's financial health hides a spiritual sickness. The weather's getting nice, despite what Selig says, and you'd like to take in a game among other noisy, like-minded people—you know, "take me out with the crowd," and all that. But there isn't a crowd, not in most places, not now. Except for in front of TVs.